Calcified dental plaque preserves a treasure trove of information about Neandertals, providing the first glimpse into the daily lives and behaviors of our most recent relative. 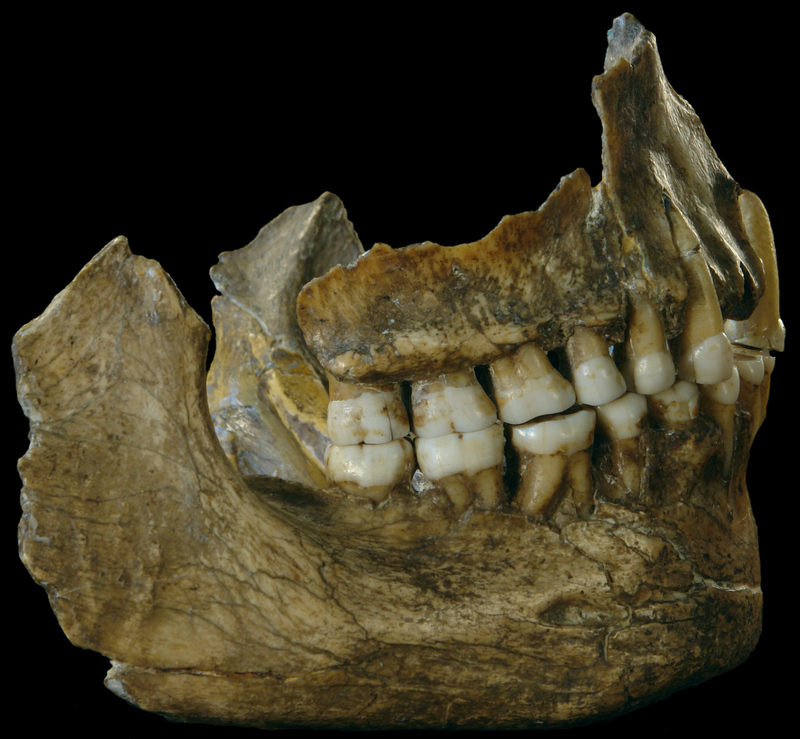 A behind the paper glimpse at the study out today in Nature, "Neanderthal beahviour, diet, and disease inferred from ancient DNA in dental calculus." Nearly five years ago, I started a post-doctoral position at the Australian Centre for Ancient DNA (ACAD) at the University of Adelaide, Australia. ACAD was looking for a medical microbiologist to develop a technique that a previous PhD student had been working on - a new method that would allow us to sequence ancient bacterial DNA preserved within calcified dental plaque (calculus). These DNA sequences could then theoretically be used to reconstruct the beneficial, commensal microorganisms (microbiota) and pathogens that once lived within ancient humans, as well as identify food particles as a means to investigate an ancient diets and lifestyles. Ancient dental calculus (calcified plaque) preserved on the molar tooth of a Medieval individual from the UK. Preserved within dental calculus are microorganisms, host cells, and food particles. Upon starting, I was immediately tasked with wrapping up a manuscript that was already nearly complete. After six months at ACAD, we published our first investigation of ancient dental calculus in Nature Genetics in 2013, igniting this new field of research. We were able to sequence the ribosomal RNA encoding gene region in ancient calculus bacteria from ancient humans, ranging from 8,000 years ago to the present. We learned that past human lifestyle alterations, especially those tied to strong dietary changes, altered the bacterial communities in the human body. We identified major shifts in the human microbiota when humans adopted farming (~8,000 years ago in Europe), and again sometime after the start of the Industrial Revolution (~150 years ago), when humans began to completely change their lifestyle using machine interventions and consume processed food on a daily basis. Although our 2013 publication felt like a huge victory, we knew we drastically needed to improve our laboratory techniques if we wanted to apply this to a wide-range of ancient humans. I set to work in our laboratory, improving the DNA extraction methods, applying the latest DNA library preparation methods, sequencing and characterizing the bacterial DNA present in laboratory reagents and lab ware, and working with Prof. Daniel Huson in Germany at the University of Tubingen to create new software that would help us properly identify any piece of bacterial DNA we were able to sequence (MALTX - https://ab.inf.uni-tuebingen.de/software/malt). After some extensive testing on Medieval British calculus, we wanted to push this newly modified method and see how far we could take it. Could we identify bacteria in much more ancient specimens? Could we trace the origins of human disease? Did ancient changes in our diet influence our health? Did we ever share diseases with Neandertals? Our long time collaborator Prof Keith Dobney at the University of Liverpool (whom I often refer to as the ‘Godfather’ of calculus research, because he began studying this gross tooth gunk over 30 years ago!) was able to put us in touch with several European museums, especially those that housed some of the most famous Neandertal specimens in the world. We traveled to different museums in Europe, including the Royal Belgian Institute of Natural Sciences, to collect ancient dental calculus from Neandertals. In Belgium, we sampled two Neandertal individuals from Spy Cave in the back rooms of the museum that the public rarely get to see. Remarkably, the Spy Neandertal teeth were robust, clean and very healthy - quite the opposite of what we observe in ancient farmers or even modern humans. At other museums in London and France, we collected dental calculus from historic chimpanzees and a wide range of ancient anatomically modern humans that lived different lifestyles in Europe and Africa. We also arranged for more Neandertal calculus to sampled and sent to us back in Australia (yes, 48,000 year old Neandertal calculus was shipped to us in a FedEx envelope!). The reconstructed jaw of the Spy II Neandertal, displaying where the dental calculus was removed from the impeccably white back molars. Courtesy of Royal Belgian Institute of Natural Sciences. This sampling process is very similar to performing a dental cleaning on a skeleton; we use a dental pick to pry off a small (4 mm by 6 mm) brittle fragment of calcified plaque, revealing the tooth surface underneath. This procedure was actually done routinely in the past to clean skeletons before exhibition or storage, discarding the calculus. 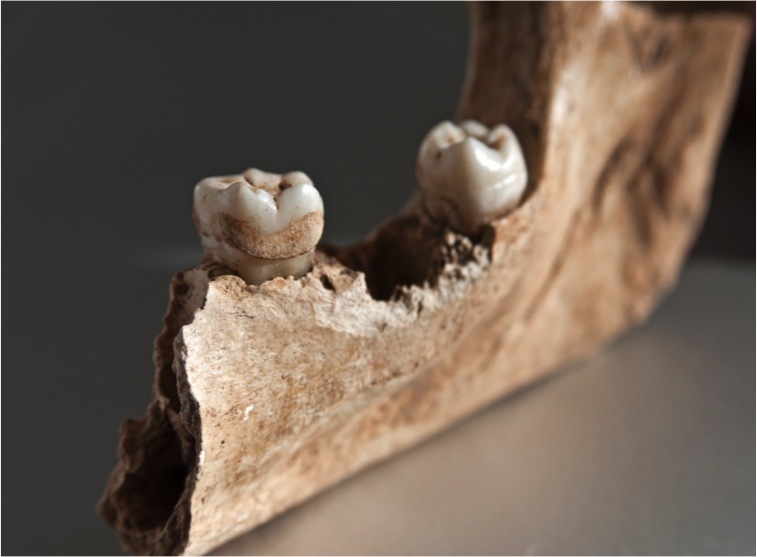 Because of this history, sampling of dental calculus today is often considered non-destructive, as the skeleton itself remains unharmed after the sample is taken - a rarity in ancient DNA research. Once back in Australia, I set to work using our new, ultra clean methods in our purpose-build ancient DNA lab, where we are required to wear full body suits, face masks, and three pairs of gloves. The ancient DNA preserved in these specimens is very fragmented and damaged, and it is easy for modern DNA to swamp out these ancient DNA fragments. By working in a purpose built facility, we protect the samples from the introduction of modern DNA, and can cleanly remove any environmental DNA that was left on the outer surface. To remove potential contaminant DNA, we routinely soak the calculus samples in bleach and then expose them to UV to remove external DNA, and we routinely and rigorously monitor bacterial DNA in laboratory reagents and lab ware. Environmental and modern laboratory contamination can provide false positive results, and is an area of ancient paleomicrobiological research that is currently vastly underappreciated. Dr. Laura Weyrich preparing ancient specimens for DNA extraction at the Australian Centre for Ancient DNA, University of Adelaide, Australia. When we finally sequenced DNA from Neandertal calculus, we uncovered a treasure trove of information about Neandertals, not only about health and disease, but also about their diet, behavior, and lifestyle. We were able, for the first time, to identify the specific foods that made up the Neandertal diet, and determined that Neandertals in Belgium and Spain had very different diets.The Belgian Neandertals from Spy Cave were highly carnivorous, and feasted on animals such as the now extinct woolly rhinoceros and wild mouflon sheep, as well as mushrooms. In stark contrast, Spanish Neandertals from El Sidron cave in Spain were likely vegetarians, eating a diet that consisted of pine nuts, mushrooms, moss, and even tree bark (the true 'paleo diet'!). It is likely that these two diets reflected the environment that both groups lived in at the time, as Spy Neandertals were living near a steppe-like environment, while El Sidron Neandertals were living in a dense forest. In this study, we were also able to reconstruct the microbiota in the Neandertal mouth, serving as the first reconstruction of microbiota from an extinct species. Interestingly, this taught us that chimpanzees, the vegetarian-like Neandertals, and ancient gatherer humans once shared a common set of microorganisms in their mouth, and that this was altered by the consumption of meat. Meat eating appears to be the first step in changing the bacteria in the human body away from what we likely carried with us for millions of years, long before we observed the impacts of agriculture and the Industrial Revolution. Lastly, we were able to reconstruct the oldest ancient microbial genome to date – Methanobrevibacter oralis from 48,000 years ago. While this microorganism can provide valuable information for evolutionary biologists and microbiologists, it can also provide some insight into the interactions between Neandertals and ancient humans. Phylogenetic analysis places the origin of M. oralis in Neandertals at ~120,000 years ago, which is around the time Neandertals and humans likely interbred. As oral microorganisms are known to be passed via kissing and food sharing, it is likely that these interbreeding interactions were more friendly than anyone ever imagined, or likely were not brash, quick encounters. This research allows us to repaint our view of Neandertals, all from the gunk stuck between their teeth. Neandertals were likely very capable, intelligent beings, living lives not different from our own human ancestors. 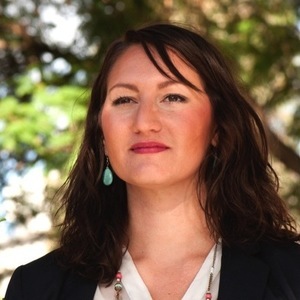 Our team of eight graduate students is now applying this method to a wide range of ancient humans that lived during the past 20,000 years from all around the world. Our goal is to reconstruct the history of the human microbiota on every continent, and in many different human cultures and lifestyles. I am absolutely grateful for the opportunity to work with such an international, interdisciplinary team; this research simply wouldn’t be possible without the knowledge and hard work of so many.